» PC Builds » What’s Going On With AMD’s RX Series Video Cards? « CyberPowerPC Gamer Xtreme GXi10200A Review, A Gaming PC That Delivers? What’s Going On With AMD’s RX Series Video Cards? In any market that you look into there is always an up and down slope of pricing and stock due to supply and demand, having enough product and other means. Right now all of the RX series graphics cards from AMD are either priced at over $400 or they’re completely out of stock on other websites. The answer is BitCoin mining. It’s unfortunate that the market had to move so drastically because of it but that’s definitely why we’re not seeing any RX 480’s/RX 580’s on the market for an acceptable price point right now. Now I’m not very knowledgeable on the subject of Bitcoins and cryptocurrency as a whole but after doing a bit of research, I understand why video cards are being used to process the “mining” of BitCoins. From what I’ve researched, the action of mining BitCoins is basically confirming the validity of transactions through the currency. This is done by solving a bunch of crazy mathematical problems to “decipher” whether or not certain transactions are legitimate. By doing this I believe that miners get a small cut for figuring it out. For the longest time, miners used processing power to automate the process of figuring out these math problems but it turns out that not long ago they found out that graphics cards actually provide a lot more speed when it comes to figuring out these problems. This is why the RX series graphics cards have increased in price so heavily. You’ll have a hard time trying to find a RX 580 for less than $400 right now. For gaming, that price is not justified at all. It makes a lot more sense to pick up a GTX 1070. But for miners, they’re willing to pay the premium since AMD cards are able to get the job done a lot more efficiently. 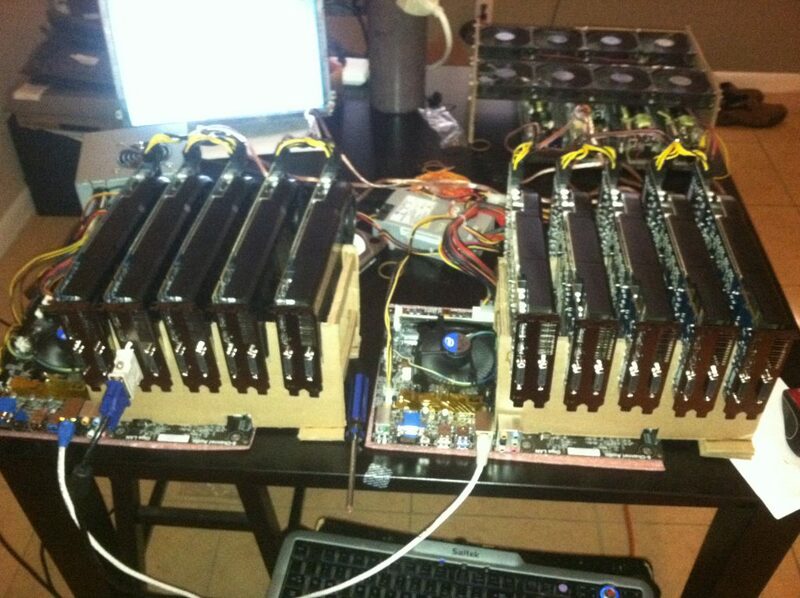 BitCoin mining farms use multiple video cards at the same time. Since everywhere is out of stock on the RX 480/580 and the pricing is crazy right now it could mean that miners are going to be picking up the 1070 as a substitute which could mean price increases for that card as well. Bigger miners have a BitCoin mining farm where they will purchase multiple video cards and install all of them on to the same system, allowing for more power behind the calculation of the math problems that they need to do. Pictured right is an example of what that can look like. That’s what it’d look like for someone wanting to do decent with the mining process from home. There are much bigger farms in warehouses that use up a lot of space, an entire room full of PCs that use multiple graphics cards to do what the miners are wanting them to do. With the plethora of video cards needed for those that are doing this, it makes sense why the prices have increased so much and why these cards are out of stock all the time. As I said earlier, I’m not knowledgable at all on the topic of cryptocurrency and/or BitCoin mining as a whole. I know that there is a lot more to it than what I’ve explained here and if you’d want to learn more then I suggest doing your own research. What do you think of the BitCoin mining craze going on right now? What do you know about the cryptocurrency world? Tagged amd, bitcoin mining, rx 480, rx 580. Bookmark the permalink. 4 Responses to What’s Going On With AMD’s RX Series Video Cards? Anyone trying to get into the Cryptocurrency mining at this stage thinking they are going to make a lot of money are mistaken. With the cost on the GPUs, 24/7 wear & tear on your computer, electricity, and air conditioning, it just isn’t worth it. The people who got in early and maybe have a few GPU’s to run, might be making some pocket change. Otherwise, it is the big guys with a roomful of GPU’s that started early who are making some money. The whole thing may just end up being a big “bubble pop” at some point, or the Government may just find their own way to put and end to it, as they don’t like alternate currency of any type. In May, a bill introduced in Congress called The Combating Money Laundering, Terrorist Financing and Counterfeiting Act of 2017 if passed, would affect digital currency, Digital currency owners with accounts valued at $10,000 or more must always report their funds or risk having them seized. It will probably take some time for the GPU market to return to normal pricing and inventory unless something tips the Cryptocurrency mining upside down. Thanks for the links and the extra info man. I honestly don’t mind the idea of alternative currency but the fact that Cryptocurrency is mainly used for sketchy transactions for things that shouldn’t be able to be obtained in the first place is why I’d say it’s time to do some things that can rid of most of that. I remember when BitCoin stocks were super low, selling right now would be awesome for those that got in at the ground floor. 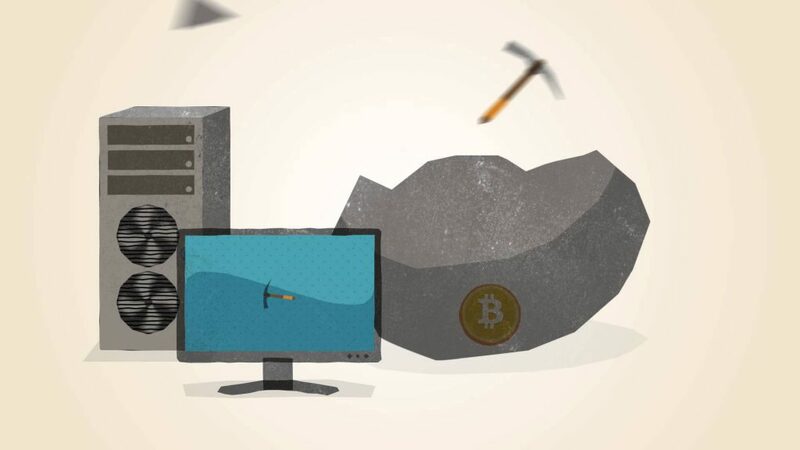 But at this point, there isn’t a whole lot that can be done to make a significant amount of money – especially with all of the competition with the other miners. I feel you on that man. It’s insane! It’s not a bad idea to wait for the craze to die down. It’s bound to happen at some point… let’s hope it happens sooner rather than later!